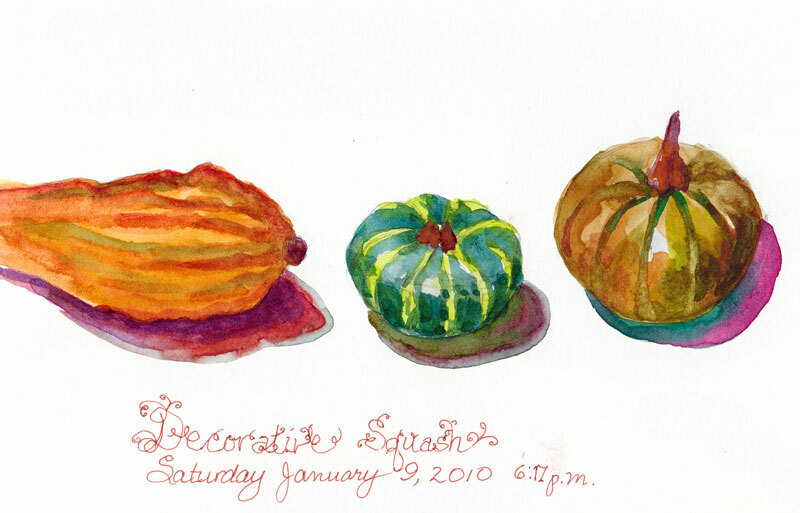 Most of their decorative squash buddies had grown unsightly fuzz and gone off to the compost bin. But these three were still pretty and when I looked around for something to sketch last week, they cried out “Choose Me! Choose Me!” So I did. I wanted to paint today. And I didn’t. I had a headache that wouldn’t go away and a bunch of boring, annoying chores to do. I had to return a jacket to Costco that was so wonderfully, fuzzy green but unfortunately, also oddly misshapen). The gas tank “empty” light in my car had been on for days (my least favorite chore, second only to dragging the trash cans out to the street, which I pay a neighbor boy to do). I needed to go to Target for cat litter (and since Fiona only recently decided to start using the litter box again for ALL of her needs and not just some, I didn’t want to discourage her with a dirty box.) And I wanted to take a walk before the predicted week-long deluge of rain started. So I sacrified a day in the studio that probably would have been a struggle anyway, feeling crummy as I did, and took off on a long walk to Radio Shack in Albany to buy new ear bud covers for my iPhone since one had disappeared. Hints of tobacco and toilet? On the way home, I stopped at Peet’s Coffee to sip and sketch. I saw this sign from across the room and thought “that can’t be right!” It was advertising their new coffee, Sumatra Blue Batak, claiming in fancy script that it was “Smooth and full-bodied” and had (what I thought I read) “…hints of tobacco and toilet…” . Huh!? I squinted and looked more closely and saw it said “hints of sweet tobacco and toffee” Even with the toffee though, I’m not sure I’d want to drink coffee that tasted like tobacco. Ick. I completed all my errands, the headache is almost gone, and with Monday and Tuesday off, I still have two days to paint and enjoy being cozy in the studio while it rains. Sorry to bore you with my stupid day and list of chores. Maybe I should have just posted the picture and then shut up? Lovely gourds – did you know that you can dry these out then carefully saw them vertically into two then hinge them back together with pages in the middle to make a gourd book. I have one that I am going to do by and by. Nah! Someone else’s stuff is always better than my stuff! I loved reading about your day, chores and all. It makes internet people real. I had a low grade headache yesterday as well – my sympathies to you, but I managed to paint a little. Then I used it as an excuse to surf and read people’s blogs instead of working… I am sure you never do that! Nah… I want to hear, Jana– your day comforts me about my day. Your decorative gourds and lettering are delightful. I found your day quite interesting and thank you for sharing. As Alex says “it makes internet people real”. Hahahaha. And now I hope to continue working on a Yupo paper watercolor I started a few weeks ago. No kitty litter in my life thank heavens. ps. Alison MUST tell us more about gourd books! WHAT? You have a great sense of humor, even when your day isn’t so great! I loved hearing about it and can relate, totally. Wishing you many more art days in the studio. And, days without headache. Yep, I agree….give us the details! although the paintings are always good, too! LOL, no, please don’t “shut up”! I loved hearing all the innanities of your day. 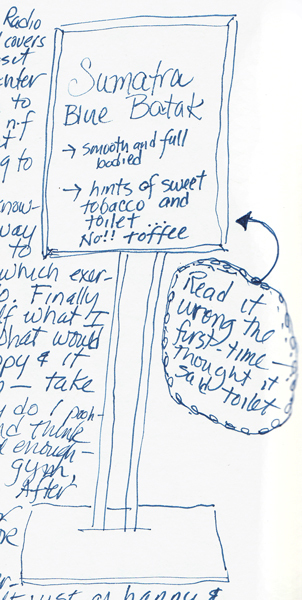 You got me laughing at the “hint of tobacco and toilet” sign!